Whether your holiday light show involves decorating a small indoor tree or setting up an award-winning outdoor display featuring thousands of lights, the period from Halloween into December is when many of us are digging our holiday lights out of storage to decorate indoor trees and outdoor landscape features as a celebration of holiday cheer. That cheerfulness is sullied though—or at least delayed—if those strings of holiday lights fail to light up. 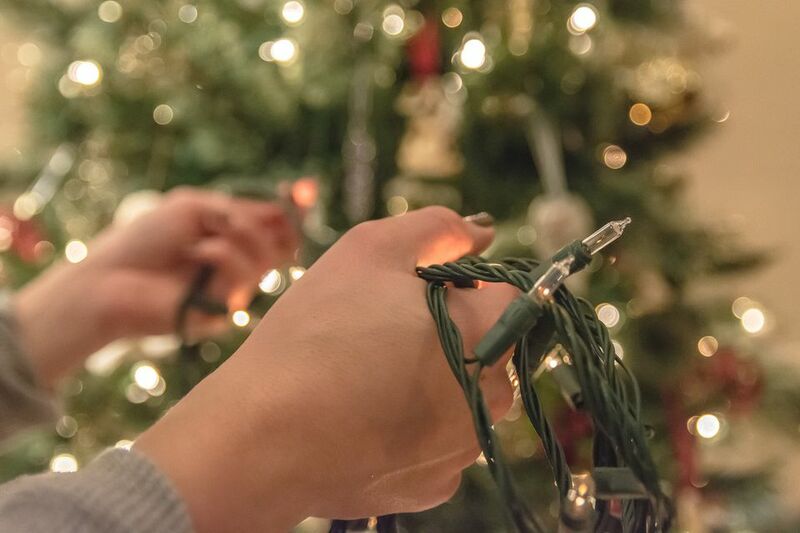 Before throwing those strings of lights away and buying new ones, take some time to examine and fix them if possible. Here's an easy troubleshooting process for checking your strings of Christmas lights and fixing them if they are faulty. It sounds too simple to be true, but when testing your lights, make sure you are plugging them into an outlet that's carrying power. If the string of lights appears dead, there's always the chance that the circuit's breaker has tripped and isn't providing an electrical current to the outlet. Check the main service panel to make sure the circuit breaker is in the ON position, and reset it if it has tripped. Now use a circuit tester at the outlet to make sure it is carrying power. Modern sets of mini lights have a small cartridge fuse found in the cord plug, inside a small sliding door. Slide this door open, pry out the small glass fuse and examine it closely. Some light strings may have two fuses; examine them both. It's usually possible to see a break in the small metal filament inside the glass fuse if it has burned out. If the fuse is bad, replace it with a duplicate of exactly the same size and rating. Electronics stores or hardware stores will sell replacement fuses. A fuse can also be checked using a common electrician's tool called an ohm meter. The goal is to test the fuse for continuity—if the fuse is operating correctly, the fuse will show no resistance. Very often, the problem is with individual light bulbs in the string. This is easy to spot in some light strings because you can spot the individual bulbs that have gone dark. Sometimes the light bulbs will simply be loose in their sockets—just pressing them firmly in place may restore the function. In older lights strings, though, a single dead bulb may cause the entire string to go dark. Here, it can be quite time-consuming to replace individual bulbs until you find the culprit causing the problem. The job is easier with a Chrismas light bulb tester—an inexpensive little tool that you can buy online or from many hardware stores. There are different types of testers available, including "touchless" models that you simply hold close to each individual bulb to identify if it is bad. With other tools, you remove individual bulbs and slide the plug portion into a small socket on the tool to test it. If none of the individual bulbs are faulty but the light string still refuses to light up, there is a chance the shunt wires in the light string are faulty. When working correctly, there is a wire shunt in the string that bypasses each of the individual light bulb sockets. This is designed so that power continues to flow when an individual bulb is burned out. But if the shunt wire itself is faulty, the light string will fail to operate correctly. The Lightkeeper Pro is a trigger-operated tool that sends a pulse of current through the light string to identify the faulty light bulb and repair the shunt. The tool comes in a kit form that includes extra light bulbs, a continuity tester, and even a battery tester for testing various batteries.